Rustle up some true Texas smokehouse taste with all the flavor and none of the fuss. 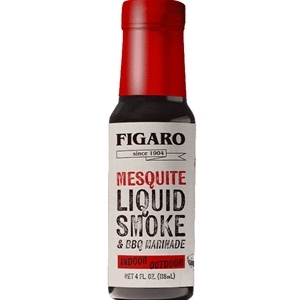 Figaro Mesquite Liquid Smoke flavor-izes your meat recipes that call for a dash of the Old West and a heaping helping of barbecue flavor! 4 fl. oz. Water, Mesquite Smoke Flavor, Vinegar, Hydrolyzed Soy Protein, Sugar, Caramel Color, Spices.